Ting took to social media to write: ‘I’ve just come home to find my mother has savaged my dog. She said it would be cooler this way. My poor Chow Chow.’ Ting’s mum thought that the hot summer months in Taiwan, where temperatures reach highs of 35 degrees, would be too uncomfortable for Duo Duo in her thick fur coat. 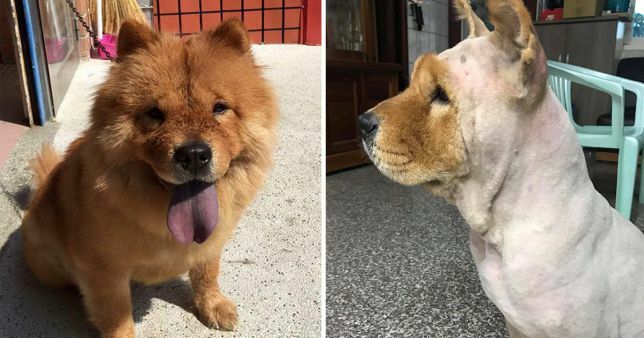 While Ting was out, she took matters into her own hands and shaved the pooch almost naked. Ting said that while she’s embarrassed by her pup’s new hairstyle, Duo Duo doesn’t seem to mind it at all. Her fur will probably take a couple of months to grow back. Sure, Duo Duo’s a bit nakey right now, but as long as she’s cool and happy, that’s the main thing.